Legislature staff have for many months suffered the indignity of toilets being closed due to water cut-offs and sabotage. This has resulted in the legislature having to close early on numerous occasions. Dedicated staff have become totally frustrated with this continued disruption at the workplace. We were not prepared to simply sit back and “go home with the flow”. We therefore racked our brains and came up with a solution that would work. As a result, the DA installed water containers in the private bathroom of the leader’s office. Public Works fitted a new tap so these containers could be easily filled when there is water. It has taken since April to make this a reality. 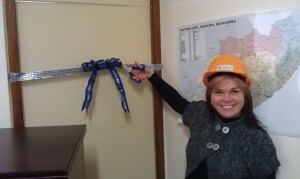 DA MPLs and legislature staff had an official “ribbon-cutting” ceremony the opening of the new loo. Although some people might see this as a light-hearted report, it is indicative of the extremely frustrating working environment that our staff are subjected to on a daily basis. Thank goodness our staff are now free from pump failures, reservoirs running empty and internal sabotage. The indignity of not having functional toilets is something that can never be tolerated in our society today.